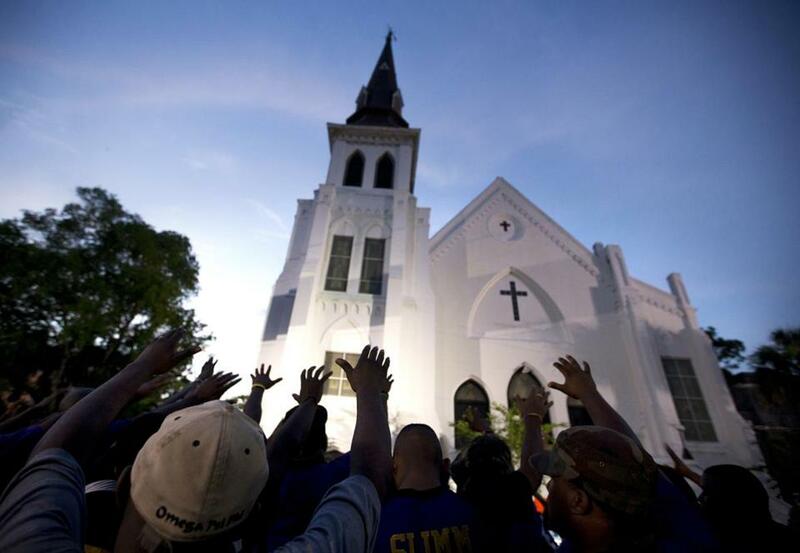 People prayed outside the Emanuel AME Church in June 2015. Dylann Roof arrives at Emanuel AME Church in Charleston, South Carolina, in a dark Hyundai sedan. He enters the church through a side entrance and spends about an hour with parishioners attending a Bible study. The gunman pulls out a concealed handgun and begins shooting, killing nine parishioners. A police document says he stood over a witness and made a racially inflammatory remark. Charleston police post a tweet saying they are responding to a shooting at the church, an hour later describing the suspect as a white male, approximately 21 years old, slender build and wearing a gray sweat shirt, blue jeans, Timberland boots and clean shaven. Before 1 a.m., Charleston Mayor Joseph P. Riley confirms that nine people are dead in a shooting at the church. State Sen. Clementa Pinckney, who was pastor of the church, was among the people killed. Charleston Police Chief Greg Mullen says the FBI will be involved in the investigation and that police consider the shooting a hate crime. President Barack Obama expresses anger, sadness and heartache at the church shooting that left nine dead. He says it shows the need for a national reckoning on gun violence in America. The names of those killed are released. They are: Pinckney 41; Cynthia Hurd, 54; Tywanza Sanders, 26; Sharonda Singleton, 45; Myra Thompson, 59; Ethel Lance, 70; Susie Jackson, 87; the Rev. Daniel Simmons Sr., 74; and DePayne Doctor, 49. A friend of Roof’s, Joey Meek, says Roof had told him recently that black people were taking over the world and that something needed to be done for the white race. South Carolina Gov. Nikki Haley says the gunman in the Emanuel AME shootings should get the death penalty. The head of the National Association for the Advancement of Colored People calls the slayings an act of ‘‘racial terrorism’’ and says the Confederate flag flying on the South Carolina Capitol grounds in Columbia needs to come down. Roof makes his first court appearance, with victims’ relatives making tearful statements, offering him forgiveness. South Carolina permanently lowers the Confederate flag from Statehouse grounds where it has flown atop the dome or on the grounds for five decades. After five years of saying it was a settled issue, Republican Gov. Nikki Haley pushed for the swift removal of the flag after the church shootings, and the Legislature agreed. State prosecutor Scarlett Wilson announces she will seek the death penalty against Roof for nine counts of murder, calling it the ultimate crime that deserves the ultimate punishment. A date has not been set for that trial. Roof’s friend Joey Meek is arrested on a charge he lied to federal investigators. An indictment said Meek told an FBI agent he didn’t know specifics of Roof’s plans when he really did. In April, he pleads guilty. He does not testify at Roof’s trial and is awaiting sentencing. U.S. Attorney General Loretta Lynch announces federal prosecutors will seek the death penalty. A black inmate chases down Roof as he goes to the shower at the Charleston County jail and punches him several times. Roof has bruises on his face and back, but decides not to press charges. U.S. District Judge Richard Gergel rules Roof is competent to stand trial. Roof’s lawyers asked for what turned into a two-day hearing after he told them he wanted to be his own lawyer. Federal jury finds Roof guilty on all 33 counts, including hate crimes and obstruction of religion. Judge holds a second, closed-door competency hearing for Roof, over objection from several media outlets including The Associated Press. After the hearing, Gergel rules Roof is competent both to stand trial for sentencing and to represent himself. Jurors return to Charleston’s federal courthouse, where Roof’s sentencing trial begins with opening statements from prosecutors and Roof himself, who uses his time to briefly tell the jury he has no psychological problems and asks them to forget what they’ve previously heard from his lawyers. Over the next four days, prosecutors call more than two dozen witnesses, most of whom are relatives of the slain who give emotional testimony. Jurors deliberate Roof’s fate for about three hours before returning a verdict of death.